Cartoonist Molly Norris took a principled, tongue-in-cheek stand, and now she’s getting some rather cold feet. 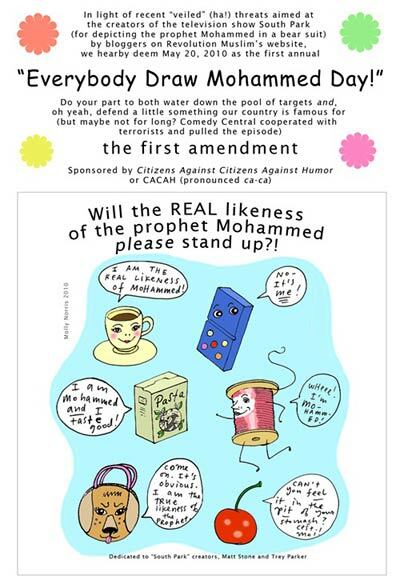 The Seattle artist was irked by Comedy Central’s recent refusal to air a South Park episode depicting the prophet Mohammed—a big no-no in Islamic circles. The censorship came in response to threats against South Park creators Trey Parker and Matt Stone by the website Revolution Muslim, which according to the Internet rumor mill is run by an Israeli Jew named Joseph Cohen. Actually, South Park has depicted the prophet in the past with little fanfare—see Boing Boing’s interview with Parker and Stone—but that was before the European cartoon-contest uproar, and before Dutch film director Theo Van Gogh was murdered for his work on the short film Submission. In any case, to protest the censorship, Norris created the satirical poster at left (which needs some copyediting) and put it on her website. She then sent it to Dan Savage, the always-provocative editor of Seattle alt-weekly The Stranger, who posted it without comment last Friday on the paper’s Slog blog. Somehow, Norris thought it would remain local. Norris’ poster went viral, even inspiring a Facebook group and counter-group. And Reason magazine promptly joined in, asking readers to submit drawings of the prophet, which it promised to publish on May 20. Generally speaking, do you agree or disagree with Comedy Central’s decision to censor parts of a South Park episode deemed offensive to some Muslims? Sorry, but I’m so with the the Republicans and the South Park guys on this one. Muslims and Christians and Jews—and, for that matter, unbelievers—have every right to be angry, to carry picket signs, to write letters to the editor, rant in the blog comments, or change the channel when somebody disrespects their object of reverence. But free speech, when tested, is never pretty. It pays to remember that Supreme Court free-speech cases don’t involve polite Midwesterners and the like, but rather people like Hustler‘s Larry Flynt or Westboro Baptist’s Reverend Fred Phelps—people who say and do and print extremely offensive things. And if they offend you, well, don’t buy their magazines—or try and sue them if you like. But nobody should be allowed to use religion to take away other peoples’ right to self-expression. Least of all here. Because, you know, in addition to Yahweh and Jesus and Allah, we Americans also worship a 223-year-old document that strongly implies something to this effect.